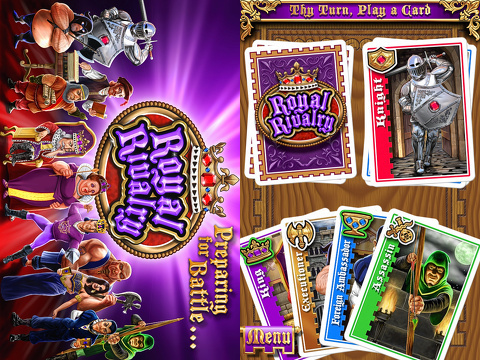 Royal Rivalry is a trump based card game by Applesauce. You take turns trying to overcome your opponent’s current and next move. This app needs iOS 4.2 or later and is compatible with the iPhone, iPod Touch, and the iPad. There are three card types and three special cards with a total of twelve different looking cards. This is a simple game of luck and prediction. 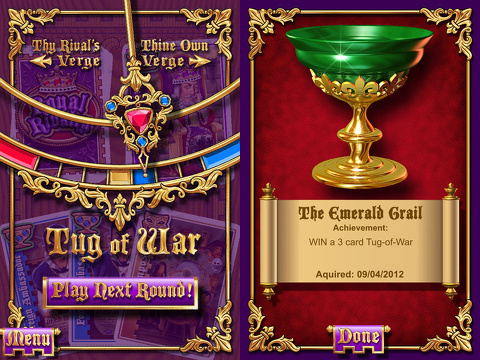 You select a game mode then set player’s hand to three, four, or five cards. Either you or the AI start the game off and try to counter one or the other’s move. Press and hold on a card to select it then move it by dragging from the bottom to the top or flicking it. Cards are replaced for each one a player plays and the deck will be automatically shuffled when every card in the deck is used. The card will only cover the card if it beats it or if the rules allow it to go there. Chalices lose to shields, shields lose to crowns, and crowns lose to chalices. A higher ranking chalice will beat the lower rank chalice, etc. The special cards like assassin will trump green bordered cards, the impostor which is pretty much the wild card can become any card that needs to be trumped with the exception of itself and the executioner, which overwrites the current card and you have to place any card other than an executioner onto the playing field. The winner is the last one to play a card. A game can last a few seconds due to luck and/or strategy but mostly luck. More cards in the hand usually mean a longer game. Classic mode features single rounds and tug of war requires winning a number of rounds that reach the red or blue bar which is usually three rounds (can win two, lose one, and then win two more). The computer opponent “thinks” for some time and can be a little annoying. This game has a useful How to Play section and keeps the date for getting an achievement (trophies). Trophies can be viewed without being online. There is no Game Center, etc. support or any form of multiplayer. Graphics are alright because there is some pixilation on edges of cards, etc. I don’t like the art style but I did not take points off for it. The cards look like what they are named after such as impostor, assassin, king, etc. Ranks are determined by the number of gems a card has (max of three). The pendulum in tug of war swings to the winner’s side. Acquired is spelled wrong (aquired). When all the cards in the deck are used, it flips the last couple over, then shuffles for a new deck. You can see when it is down to the last three cards. The audio fits the medieval theme but nothing is amazing or spectacular. Sounds effects are slightly better such as a card transforming and making that distinct card sound. I was hoping each card will have a different sound effect when played. I want cards that feature a weapon to make a slashing sound. At least when you win, the music changes. Royal Rivalry is $1.99 on iTunes. I thought this game was interesting at first but it was very lackluster. Feels like it took one step forward, two steps back since it does certain things well but does not provide a more “fun” experience. I like the concept and it plays well but I did not find enough details in the music. I want offline and online multiplayer. For offline I’m thinking it could feature one device where you set the amount of players and trade off but somehow no one sees your hand. I do like the game for letting me quit and continue from where I left off. For now, this game is not very enjoyable (only AI battle which can be too quick or too long) but I hope it gets an update that fixes some of the things I’ve mentioned. AppSafari review of Royal Rivalry was written by Tony Lau on December 10th, 2012 and categorized under App Store, Games, Puzzler, Strategy. Page viewed 3935 times, 1 so far today. Need help on using these apps? Please read the Help Page.